As Southwest Airlines is low-cost Company it operates version of Bowing 737-700 with one class seats. This version of Boeing 737-700 has 143 economy seats. The seats of the 1st row have extra legroom. Among disadvantages: lack of floor storage during take-off and landing, lack of tray tables and lack of overhead storage as board equipment is stored here. The seats 7 A and 8F have no windows. The seats of the 10th row may be not reclining as exit row is located behind. Another disadvantage of these seats is misaligned windows. Passengers who are travelling with a partner may choose the seats 11B and 11C. These seats have extra space for passengers’ legs but are less reclining and less padded than other standard seats on this airplane. The tray tables are in the seats’ back in front and if passenger is not tall it may be uncomfortable. Also, it can get very cold by the exits during the flight. 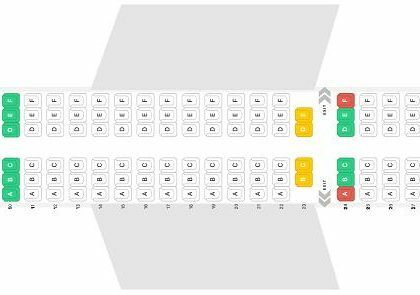 The seats 11DEF have also extra legroom but are less padded and tray tables are in the seats in front that are located on a distance, this fact may cause inconvenience for passengers with small height. It can get cold by the exits during the flight. 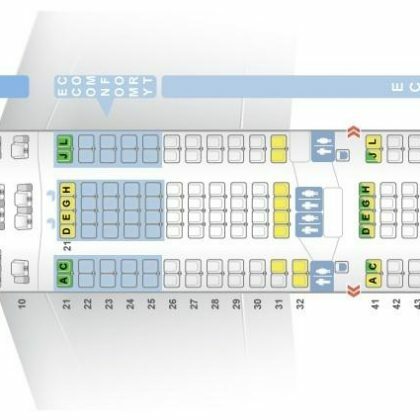 The seat 11F is also a little downward tilt. The best seat here is the seat 12A. Passenger of this seat will take advantage of extra legroom due to the missing seat in front. The seats 23C and 23D are often bumped by other passengers and service carts and are located close to the galleys. Another disadvantage is that some passengers mark that these seats as well as the seats of the 24th row are colder than other standard seats. Close proximity of the seats of the last row to the galleys and lavatory may be bothersome.